With a combined trading experience of over two hundred years in our Import department, you can rest assured that your Customs clearance needs are in good hands! We have experts in many fields including food products, who will happily guide you through this often complex area by providing advice on Port Health and MAFF regulations, Customs tariff classifications, EU requirements, licence applications and other important obligations. With direct links to the ports of Felixstowe, Southampton, Tilbury, Thamesport, Teesport, Liverpool, Immingham, Grangemouth and the London Gateway, we can facilitate the prompt release, collection and delivery of your cargo via all major UK ports. Regardless of the point of entry, we’ll save you time and money by providing a single point of contact to keep you fully informed of progress. Extensive experience in all aspects of Customs clearance. 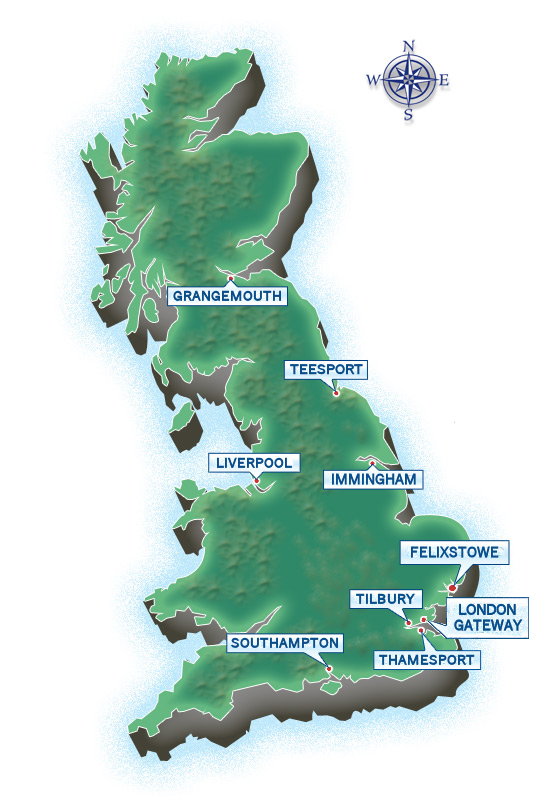 Direct links with major UK ports. * If applicable - please call us for advice.